A small shrub banksia from inland areas around Coolgardie (goldfields) in WA. Only grows to approximately 3'x3-4' and is lignotuberous with gold flowers. This is a new species that I have not grown before. 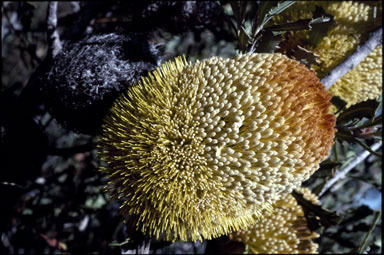 According to the Banksia Book it could take several years to flower from seed. Should be excellent for well-drained soils in hot semi-arid areas. Interesting container plant. Propagation Information: Seed germinates readily with no pre-treatments required..